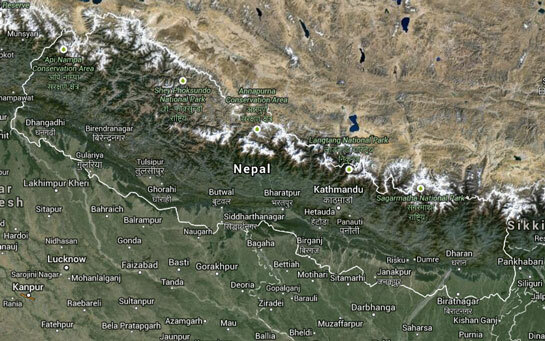 Himalayan Learning works in Nepal, which sits between India to the south and Tibet to the north. It is home to eight of the world’s tallest mountains, including the largest, Mt Everest. Nepal is also the birth place of Siddhārtha Gautam – commonly known as Buddha. Nepal is a very poor country with few resources beyond tourism and water. Until a small political revolution happened in the 1950s, the country was cut off from the rest of the world and foreigners were banned. The government also banned schools. The country has spent the last few decades going from a medieval monarchy to a modern democracy but as a result has few roads, low levels of literacy, and high levels of malnutrition. Despite the mountainous terrain and being left behind for centuries, the Nepali people are inquisitive, friendly and warm-hearted. Today, about 27 million people live in the country, speaking over a hundred languages and dialects, and coming from a similar number of ethnic groups. Many people are Hindus, Buddhists or animists, and there is a great crossover in beliefs and practices between. Nepal also has an incredible range of flora and fauna because of it’s range of geographical zones from sea level to 8,848 metres. Indeed, according to scientists Nepal has over 850 species of birds alone – more than the whole of the north American continent.